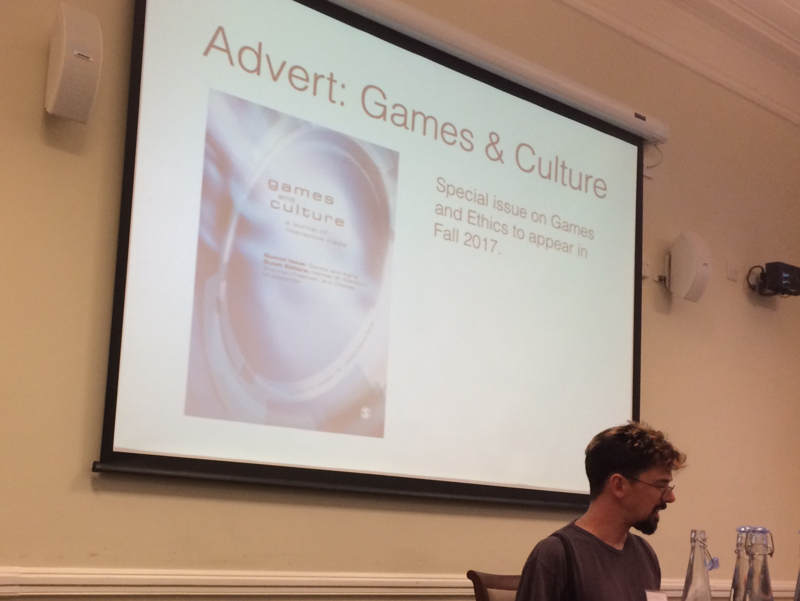 Video Games and Virtual Ethics was held at Senate House in London on July 21-22, 2017. The conference was organized by Christopher Bartel and Derek Matravers and was generously funded by the British Society of Aesthetics, and the Institute of Philosophy. Speakers included Morgan Luck, Marissa Willis, Rebecca Davnall, Stephanie Patridge, Sarah Hodge, Nele van de Mosselaer, Garry Young, Christopher Bartel, John Tillson, Helen Ryland, Vainius Volungvicius, Nathan Wildman, Amanda Cawston, Malcolm Ryan, Kevin Schut, and Esther MacCallum-Stewart. The aim of the conference was to bring together researchers across disciplinary boundaries who are working on issues at the intersection of video games and ethics. The academic disciplines represented at the conference included philosophy, psychology, communications, media studies, and game design studies. The talks covered topics such as the morality of virtual actions, how to design games to test for moral intuitions, and issues of gender and ideology in game design and character selection. The conference was free and open to the public, which provided for a well-attended conference with lively and engaged discussion.